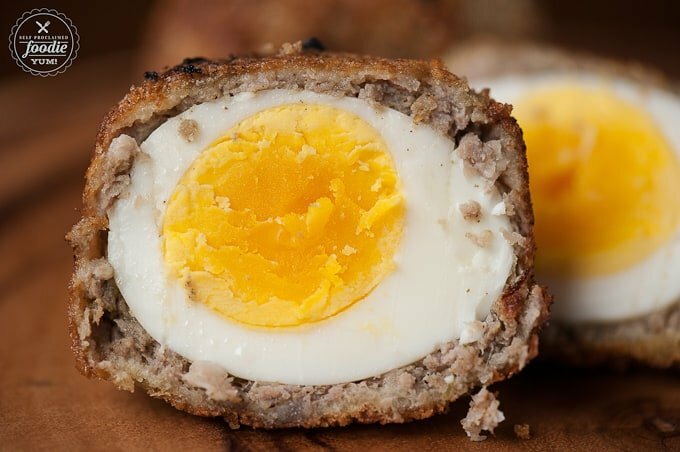 Scottish Eggs are a delicious take on breakfast. 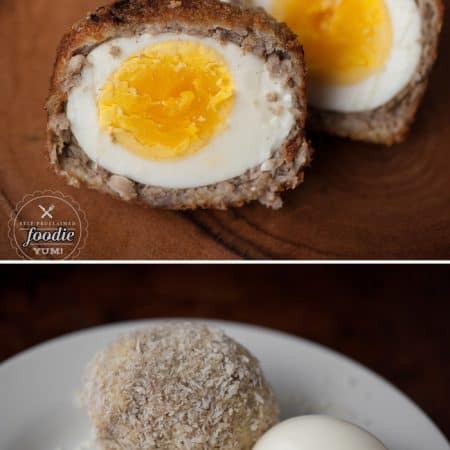 Egg wrapped in sage breakfast sausage, then dipped in egg, and then fried? Yes please. So, I had never made these before. I was quite worried I would either under cook the egg to the point where I couldn’t peel it, under cook the sausage to the point where we got sick, or over cook the entire thing to the point where it was gross. Either I got lucky or these really weren’t as hard to make as I thought they were. 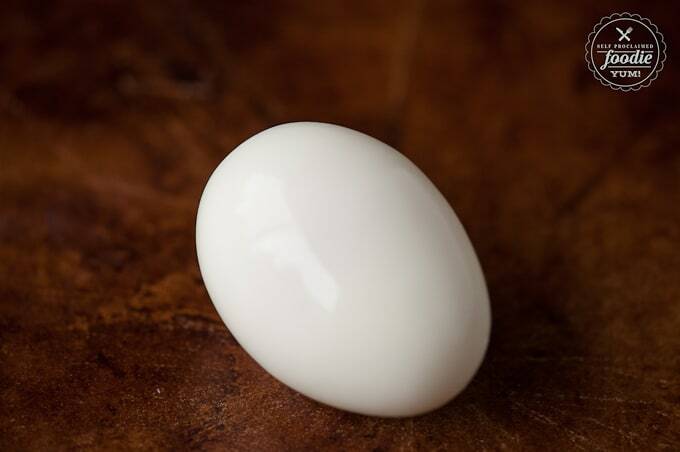 Here’s a picture of my hard boiled egg. I was proud of it because I could actually peel it. Making a good hard boiled egg has been a life long battle of mine. 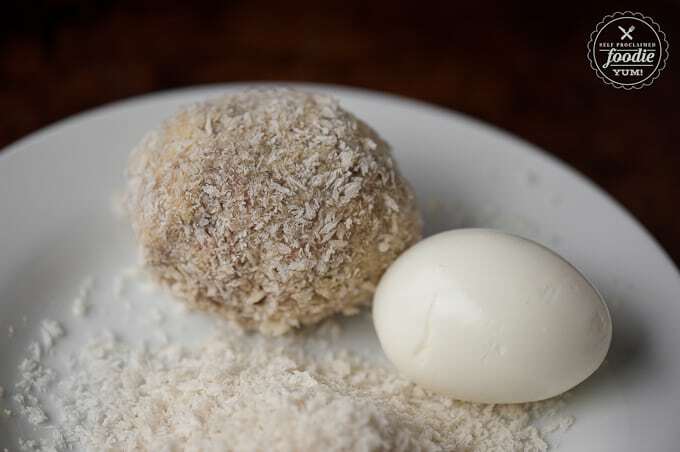 I took the photo below to show you the size difference between a plain egg (not so beautifully peeled) and one that had been wrapped in sausage, then dipped in egg wash, then rolled in bread crumbs. I tried my best to under cook them so that the yolks would run, but this was the best I could do. Either way, these were fun and delicious and I think you should make them! Start by boiling your 8 eggs for 4-6 minutes. Since you'll be cooking them again later, you want them cooked such that the whites are cooked but the yolks either aren't, or are just barely cooked. Once done, drain and immediately submerse in bowl of ice water to cool. If you didn't buy pre-made breakfast sausage, make up your own using this awesome sage breakfast sausage recipe. Set aside. Peel eggs. Divide sausage into 8 equal portions and flatten into thin discs about 5 inches in diameter. Heat oil in large pan over medium high heat. When oil is hot enough to cook a bit of flour nice and bubbly, you're ready. Roll each egg in the flour, then wrap the sausage around them to seal. Next dip it in the beaten egg, then roll in bread crumbs. Fry as many at the same time as you can fit in your pan while allowing enough space in between eggs. You may have to do this in two batches. Cook until browned on all sides, about 15-20 minutes total. Serve warm. I bake mine. 375 for 30 minutes on a wire rack. Flip halfway through the baking time. And I roll mine in Shake N Bake without the egg wash. 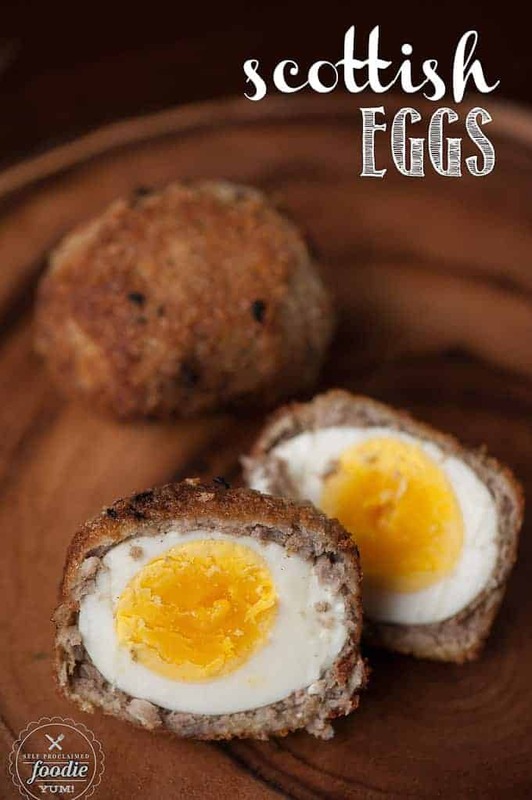 In the UK, we call these the slightly different name of “Scotch” eggs, and although they are a very popular snack, we wouldn’t normally eat them for breakfast! Yours look gorgeous! Did you fry them in a frying pan or an actual fryer? Bring your eggs to a full boil, turn the burner off and let them sit for 30 minutes. Perfect boiled eggs. Thanks, Stuart! Trust me, I make mistakes like this all the time. Thanks for letting me know!